A shot of the park's namesake. Comments: It was Easter when we took this ramble - with no real preparation other than knowing where the park was. The developed part of the park was overrun when we got there - not necessarily a bad thing - families out enjoying the day with games and barbeque. It wasn't long until the din of veneration was at our backs and out of sight. The off-leash aspect of many of the trails was a hit with Zoey, who enjoyed venturing into the brush and galavanting in the water. 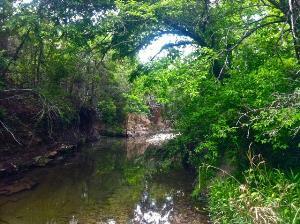 Easter 2012 in Austin was a pastoral spring day, making the hike all the more enjoyable. The power lines in the park are unsightly and, at times, unhinge the illusion of a natural getaway, but that is my only criticism of Walnut Creek Park. Definitely worth it, power lines and all.